Create pretty monthly planning calendars in minutes. Save time and effort. Ready to use calendar template! Create good looking monthly calendars as easy as filling in cell colors and letters into pre-formatted Excel cells. No special skills required, just regular Excel use. No formulas or other complicated stuff! Download is a ZIP file containing all Excel files within. 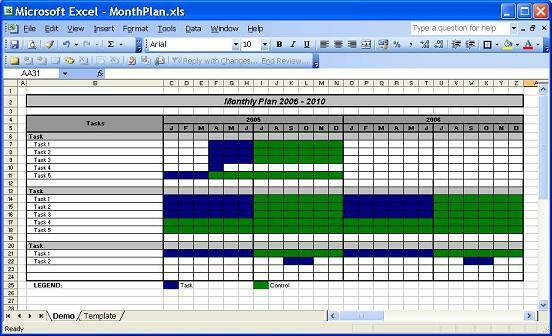 With this easy to use Microsoft® Excel file YOU will generate pretty calendars in minutes. No need to learn new software skills. Get your FREE Calendar Template now.